Someone’s unhappy. No lollipops at the bank, because Daddy used the ATM tonight. Mommy always uses the drive-up window, and the Little Guy always gets a lollipop. But it was after hours, and the window was closed. The poor guy sitting in the back seat of my car just couldn’t comprehend a world in which The Bank does not equal Lollipop. No matter how many times I explained it to him, it just didn’t load. He knew his routine, and there was no room for variation. The autistic brain thrives on structure and predictability. Unanticipated change is a dangerous thing—especially when that change means no lollipops! I tried. I really did. I tried changing the subject. But he kept circling back to the lollipop. I tried to turn it into a game, tickling him and telling him that we had a yummy dinner waiting for us at home. Nope. I even took him to the drive-up window so that he could see that no one was there. No dice. No matter what I did, he became more and more anxious. So I did what any sane man would do. I took him to the drive-through window at pharmacy across the street. They give out lollipops too. $#!† Now I was really in trouble. He started to cry. Big, crocodile tears. As we headed home, I tried a different distraction. I promised him a couple of mini Reese’s Peanut Butter Cups after dinner. But his language glitch was in high gear. First he thought I was promising him a cup of chocolate. By this time, we had pulled into the garage. He got out of the car, headed into the kitchen, and ate dinner with the rest of the family. A little disconsolate, but nothing too dramatic. Come dessert time, he had completely forgotten about the Reese’s cups. He was back home, back in his routine, and all was right with the world. We had taken a relatively incident-free overnight trip to Disney World in January, and in February we took a longer trip to visit my father in Tampa—again, with no real problem. During that trip, we took a side visit to Sarasota that blew me away. The primary purpose was to visit my mother’s grave, but we turned it into an all-day thing, throwing in a lunch at a restaurant downtown. That entailed walking through a crowded arts fair. But again, with no incident. What’s more, at the restaurant, two people told us how beautiful our family was and how well-behaved our children were. I couldn’t have been more proud! Things were going so well, in fact, that I caught myself wondering whether I was making a mountain out of a molehill with all this autism stuff. Was I just being too dramatic? 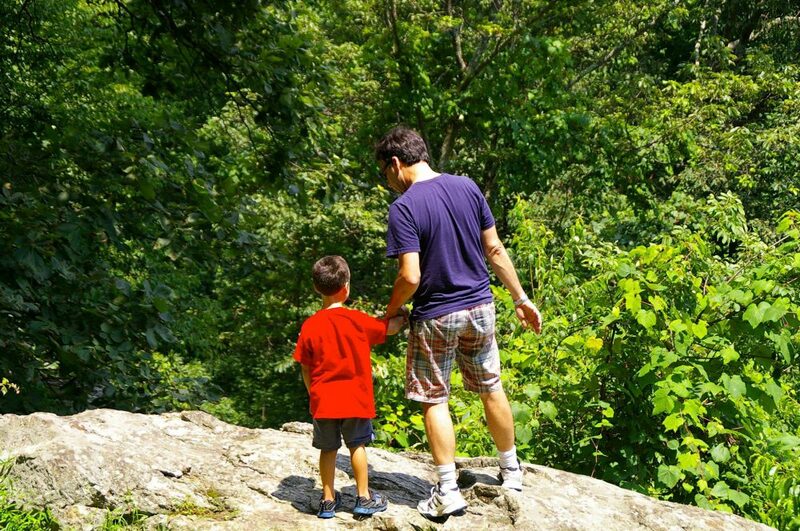 Was I letting my fears color the way I looked at my kids? Maybe I was turning my anxieties into self-fulfilling prophecies. That was a few weeks ago. Since then, we’ve had to deal with . . .
• A huge melt down from one of our private-school kids over a Doctor Seuss celebration the school had been planning. This trivial event brought back embarrassing memories from a similar one seven years prior. “I can’t go to school,” she wailed. “Don’t you remember how I had a migraine in kindergarten during Doctor Seuss Day, and I threw up? I don’t want that to happen again!” It took two hours of helping her work through it before we could get her to school. Ant that was just the beginning. For the entire week afterward, she became so anxious that she began throwing up every day. • Completely irrational anxiety from our oldest about his upcoming confirmation—all because of a cognitive glitch that left him petrified of our local bishop. Seriously, the guy’s a kindly Cuban gentleman who lives next to the cathedral in St. Augustine. But my boy was convinced that the bishop was going to interrogate him in front of the whole congregation and condemn him to hell for his sins! • Increasingly angry, sometimes violent, outbursts from our eight-year-old every evening. Once he’s surrounded by the whole family at the dinner table, he becomes jumpy and irritable. Too much stimulus that he can’t control. Too many voices talking. Too many flavors and textures on his plate. • Our ten-year-old whiz kid fighting tooth and nail instead of doing the bang-up job he was capable of on his STEM project. The melt downs bordered on the epic because Minecraft had to win out. • Our six-year-old girl collapsing into an emotional heap every time we corrected her for the slightest mishap. 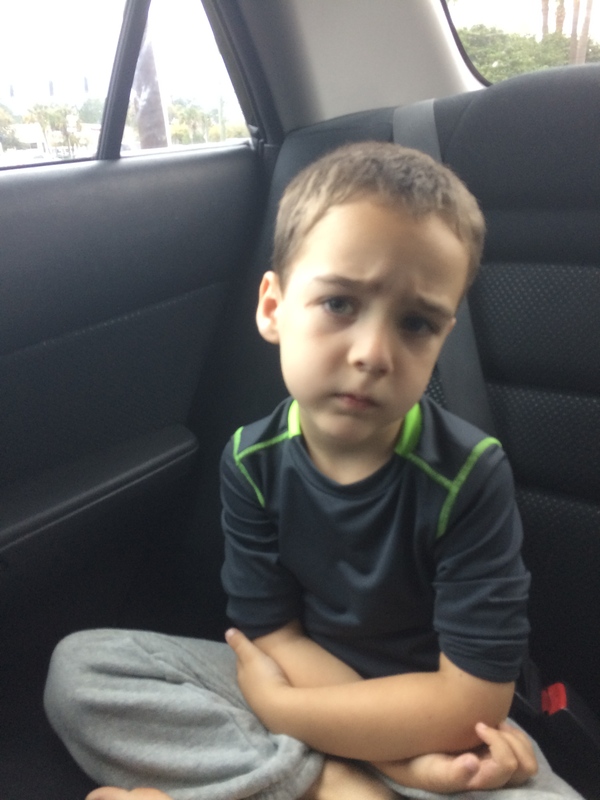 • Our five-year-old boy suddenly becoming unable to sit still for love or money. Unless he’s playing Fruit Ninja on my iPad or watching YouTube videos of Angry Birds on the computer. So yeah, it’s been a trying couple of weeks that left me wondering what the hell happened. Everything was going so well, and then all of a sudden it wasn’t. All this has shown me something, and I hope I don’t forget it. Good days come, and you get a break every now and then. Maybe even a longish one lasting a couple of months. But God help you if you ever let down your guard. If you don’t keep working with your kids, if you don’t take advantage of every opportunity to move them forward another step or two, you risk losing more ground than you thought you had gained. I knew it, but I relearned it: ASD is permanent. It’s also a tricky S.O.B. Just when you think you’ve got it figured out, just when you think your kids have it licked, it comes out of left field and says, “Not so fast, Cowboy!” This is especially true when your kids are high-functioning. They get good at masking what’s going on inside them, until they can’t take anymore. And if you’re not careful, you play along with them. It also showed me the power of the imagination. In a sense, I was in denial because there were no immediate crises to deal with. Things were relatively smooth, and I let wishful thinking take over. Rather than pay attention to the signs that some of the kids were beginning to unhinge, I slacked off and enjoyed the rest. And yes, there were signs. Katie saw them and tried to alert me to them. But I didn’t want to look. Instead, I conjured a fantasyland in my mind and tried to make the outside world conform to it. I don’t think I’m the only parent who does this, by the way. Everyone takes a mental vacation every now and then. But in the case of special-needs parents, the stakes are usually much higher. So we slid down the mountain a bit. It happens. But that’s okay. I’m back on the watch tower now. Isn’t this a cool picture? 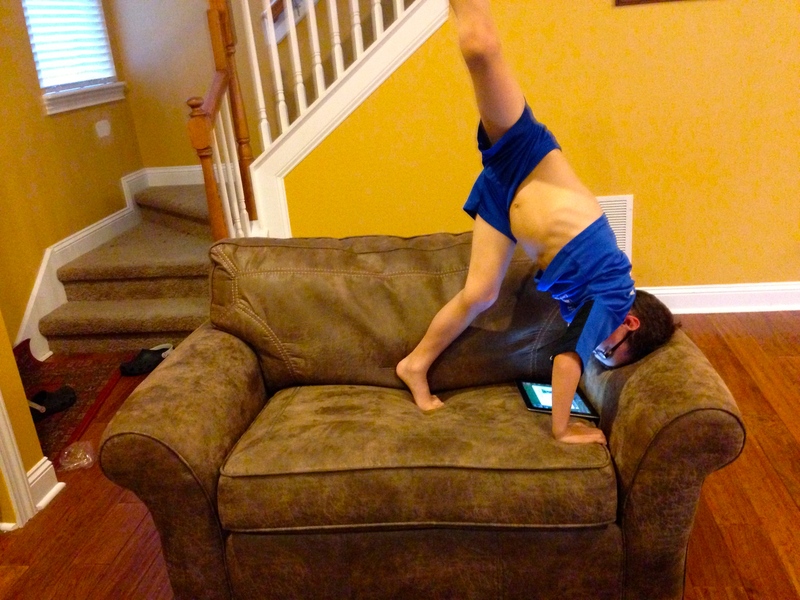 That’s our eight-year-old boy playing Fruit Ninja on the iPad. This is quite a common sight in our home. 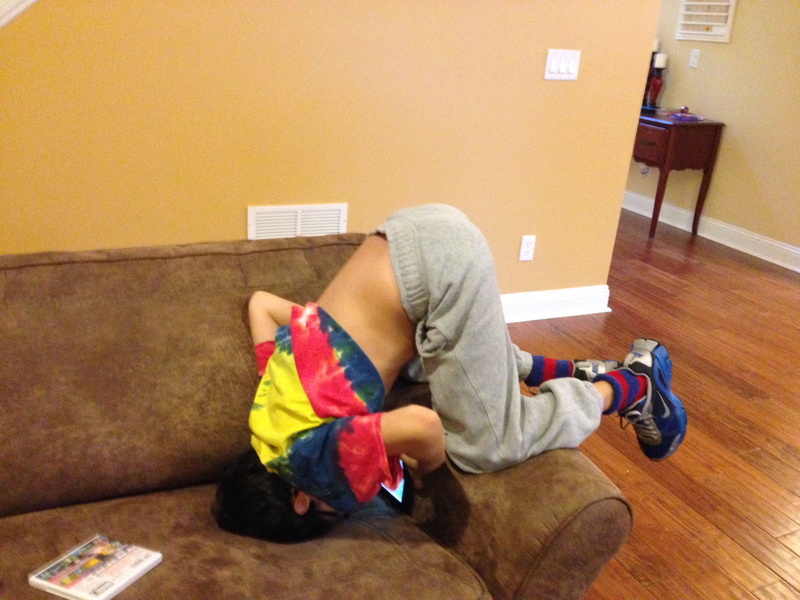 It’s just one of many contortions this kid does. He’ll fold himself backwards over the back of the sofa. Or he’ll have his legs crossed, yoga-style, and suspended in the air while he rests on his shoulders. Or he’ll curl himself up in a ball, with one leg sticking out at a highly improbable angle. Or a combination of many different poses. He’s never in the same position for more than a couple of minutes. When he’s not twisted up, he’s like a perpetual motion machine—hopping, dancing, mock-battling, wrestling with his reluctant little sister. Dinner is always difficult for him. He’s usually the first one out of his seat (within three to five minutes), running around or hopping up and down. Even taking a walk can be an exercise (sic) in unique movement. 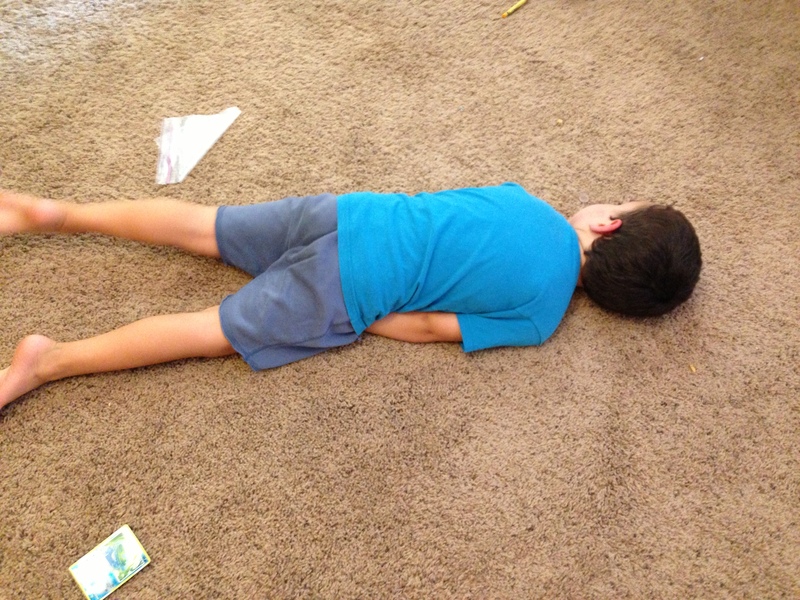 Now, this is a marked contrast to his younger brother who will, at odd times, simply plank. Katie and I think he does this as a coping mechanism when he gets overwhelmed. He just shuts down for a few minutes, presses his internal reset button, and then he’s back at it again. He’s just as hyperactive as his brothers, but he has a different way of dealing with overstimulation. Funny enough, though, if you put any of these kids in front of a computer on Minecraft, they can sit still, absorbed, for hours. They may be at odd angles again, but they’re still. Katie and I think it’s related to something called Intense World Theory. Pioneered by a pair of neuroscientists in Switzerland, Intense World Theory posits that people with autism are hyper-aware of everything going on around them and within them. ASD folks feel everything so intensely—both physical and emotional—that their attempts to compensate need to be just as intense. It’s like an autistic version of Newton’s Third Law of Motion: For every action, there has to be an equal and opposite reaction. So our armchair contortionists are merely reacting bodily to the busyness around them and in their minds. Their world is so intense and so full that they react to it in a similarly intense, involved way. Or it’s so intense that they need to shut it out at times, as our little one does, so that they can press their internal Reset button. This also explains their ability to become so absorbed in the world of video games. It can be very loud and frenetic, but it is also limited and contained. Just a small screen (okay, small-ish) that they can turn on or off. And as noisy as it is, it’s also pretty predictable. So there’s an element of safety and comfort there. Of course, engaging in the virtual world doesn’t really help them get out their pent up energy. It only helps them suppress the need for it and, therefore, suppress their need to (over)react to it. All this can be kind of cute, but there’s another, more troubling, side to it. Take my oldest son, for instance. He likes to go to Teen Gamers, a monthly gathering of middle- and high-school students hosted by the local library. It’s a place where kids can hang out, play video games, and have pizza, all under adult supervision. I don’t mind that it’s all about video games. Considering his social anxiety, it’s a golden opportunity for him to expand his social circle. But as much as he enjoys himself there, as soon as he comes home, he hurries up to his bedroom and spends the next couple of hours in virtual seclusion. The same can happen after a long day at school or after we all go somewhere as a family. In fact, after just about any situation where he is out of his comfort zone, the boy high tails it to his room, turns off the lights, and burrows under the covers with his 3DS or his iPod Touch. The outside world is too much for him to handle, and he needs time to decompress. Something similar happens with my older daughter, although with her, the reaction isn’t always delayed. She is just as likely to melt down right in the middle of a store or restaurant as she is to wait until we get home. That’s why we’ve come to expect her to spend a considerable amount of time in the bathroom at church on Sundays. That’s how intense the world can be for these two. It can actually hurt to be engaged in it for too long. I like this explanation a lot. 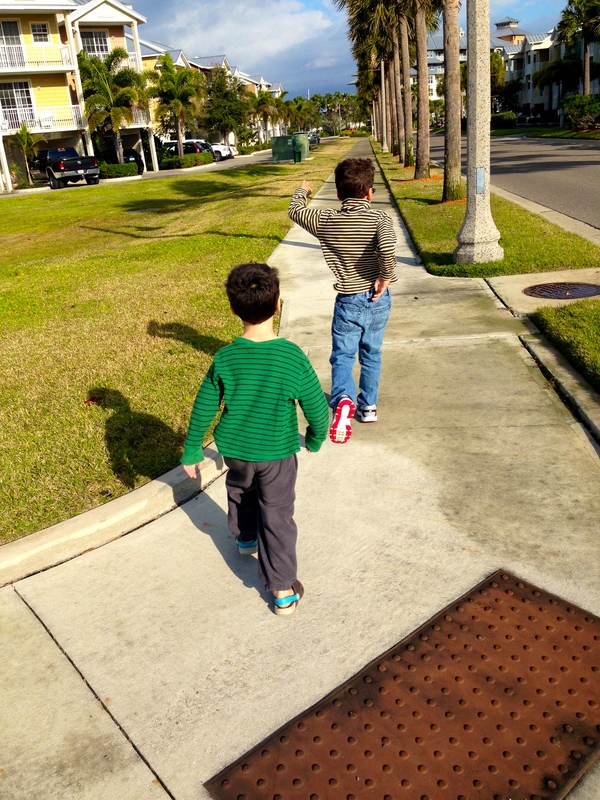 It helps me see that my kids are not being antisocial—at least not on purpose. It also gives me some more insight into the way their brains are wired. And most important, it helps me adjust my plans and expectations. I know, for instance, not to expect them to be able to handle a marathon day at Disney World. I should be happy to get three hours out of them—and that’s with one or two breaks so they can regroup. It also helps me understand what school is like for them. They spend six hours trying to maintain an ordered exterior while everything around them (and within them) feels like it’s set on overdrive. Of course they’re going to need some serious decompression when they come home—whether that means time on the trampoline or some mini-hibernation. There’s no way we should expect them to do anything productive like homework right away. And on days when there’s a lot of homework, we know we need to break it up into smaller chunks—or tell their teachers that they’ll finish it the next day. Now, I know that they can’t expect this to go on forever. They’re going to have to find other ways to cope when things get too rough. There aren’t too many workplaces that have yoga mats or dimly-lit quiet rooms for decompression. And God help you if you take too many breaks! So we are trying to teach them how to increase their tolerance and find other, less obvious, ways to deal with all that frustration and overstimulation. It’s all part of living with ASD. They’re not being silly or stubborn or sullen. They’re just trying to survive.